We are surrounded by brilliant innovations, some old and some new. Electricity, weaving, combustion, language: each one began as an unthinkable notion. Each had passionate people who believed it could be done who tried, failed and tried again. The dedication of countless visionaries surrounds us. Agriculture itself is such an innovation, one that is constantly re-imagining itself through the needs and dreams of every generation. Each new variety of vegetable is the evidence of a constantly changing, constantly adapting, constantly innovating world. The bright, floral flavor of Habanada inspired chef Nora Antene to create this Habanada Sherbet. Michael Mazourek is one of our heros, let me count the ways: father, Cornell professor and effortlessly hilarious, Michael is also one of the top organic plant breeders in the world. Michael is also unique for being one of the few plant breeders who is publicly developing varieties with culinary quality in addition to disease-resistance and productivity. You may be familiar with some of Mazourek’s varieties that have already changed the way we eat, like Honeynut Winter Squash (a super small, super sweet butternut) and Silver Slicer Cucumber (a sweet, crunchy white slicer with notable disease resistance). He is constantly playing with his food, using classical breeding (non-GMO) methods to dream more delicious, more productive & more disease resistant varieties into existence. As a species, we’ve been saving seed for 10,000+ years; it is because of people like Mazourek that we have cultivated such extraordinary diversity in such little time. It all started when the University of New Mexico discovered an off-type plants in their Habanero lines that didn’t even register on the Scoville scale. (Habaneros often register 40 times hotter than Jalapenos on the Scoville scale of pepper pungency.) Mazourek, a plant breeder interested in peppers, was sent some of these seeds to study. Thus began the journey to Habanada. 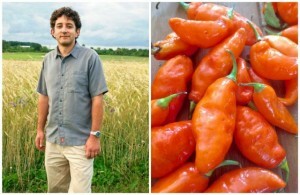 Michael Mazourek and his Habanada: the first truly heatless Habanero is full of rich, tropical flavor. Photo of Habanada by Matthew Goldfarb; photo of Mazourek from Cornell’s EZRA magazine. Mazourek wondered, “what if there was a pepper I could share with my friends who didn’t like hot peppers so they could taste what I love without the heat?” This was Mazourek’s first foray into plant breeding and he was optimistic: a gene for heat, in a laboratory, is simple to identify. But in the field, he soon discovered that it wasn’t so simple; some peppers were delicious, some tasted strange, and still others tasted just plain bad. Few truly tasted like a bright, floral habanero. When he realized there was more to it than an assay in the lab, Mazourek shifted his approach and back-crossed his heatless lines to full-heat habaneros. “Though I didn’t know what exactly was going on, I learned as I went,” Mazourek recalled. “As I was changing this pepper, this pepper was changing me.” After tasting thousands of peppers in thirteen generations of rigorous selection, Mazourek has stabilized the dream of a full-flavored, heatless Habanero. Habanada has quickly captured the imaginations of chefs, farmers and eaters all over the country and all over the world. “Habanada has such unique floral qualities,” remarked Nora Antene, the chef of Portland, Oregon’s renowned Le Pigeon restaurant. Antene was paired with Mazourek’s Habanada at the 2014 Culinary Breeding Network Variety Showcase, an event bringing together plant breeders and chefs to create innovative, delectable dishes highlighting the importance of variety development. “Habanada was simple to showcase: it seems complete on its own,” added Antene. 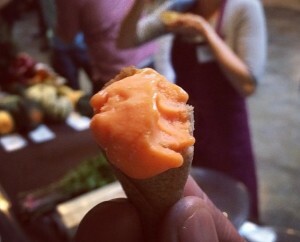 For the event, Antene created a Habanada sherbet that electrified the event. Anticipating the coming summer and the subsequent pepper harvest, Antene is already dreaming of strawberry-Habanada shortcake and Habanada crème brulee as well as its above average contributions to classic pico de gallo. Habanada is also being featured at Expo Milano 2015, a six-month celebration of concrete solutions to providing “healthy, safe and sufficient food for everyone, while respecting the Planet and its equilibrium.” From its innovative development to its unique flavor Habanada truly deserves this recognition. 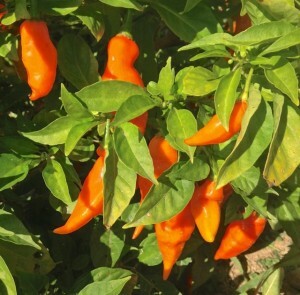 Habanada is easy to grow and thrives in low fertility, offering up to a pint of fruit per week. This season you’ll find Habanadas on the menu of incredible restaurants from coast to coast and indeed all over the world. You can also grow your own, and here are a few tips to keep in mind. “Habanada will easily become a hedgerow with few fruits if they are grown with too much nitrogen,” Mazourek warns, “so go easy on the compost.” They love heat, full sun and even water. Each plant will produce about a pint per week once they start fruiting. Though Habanada has a have a wide window of delectable ripeness, we try to harvest when they are bright tangerine orange and two to three inches long, perfect for popping into your mouth. Indeed, the rich floral character is in the seeds as well as the flesh, so enjoy your Habanadas in their entirety! This season you can find certified organic Habanada transplants through Fruition Seeds as three-inch pot transplants for gardeners as well as 72 plant trays for farmers. Plants are also available at Fruition Seeds’ farm store every Saturday in April, May and early June in addition to their 200+ varieties of organic, regionally adapted vegetable, herb and flower seeds as well as seed potatoes and transplants of other great varieties. Are you a chef looking for a farmer to grow Habanada for you? Are you a farmer looking for a chef to buy your Habanada? Are you interested in having Habanada available at your local farmer’s market? Contact Fruition Seeds to see if there are any farmer/chef/market connections we may know to meet your need! Petra Page-Mann is a co-founder and co-owner of Fruition Seeds, customizing organic seeds to thrive in the Northeast. You’ll find 200+ certified organic, regionally adapted varieties available at www.fruitionseeds.com and contact her at petra@fruitionseeds.com. i have two happy plants, covered with peppers, they were outside, they are now inside. Question: when do i harvest the peppers. it seems if i wait for them to fall off, they just rot in place. Thanks for your question! I would suggest forwarding your question to the author of this article, Petra Page-Mann, at petra@fruitionseeds.com. I’ve been picking them as they turn bright orange. They seem to have the best flavor. The yellow and pale chartreuse fruits lack to subtle developed flavors. They are DELICIOUS! Where can I get some seeds? You can order seeds online at Fruition Seeds; it costs $3.50 for 20 seeds. Hope this helps! Where can I get these? I mean not the seeds, but the real deal. There is some recipes that would like to try with the pepper in question. I live in Finland, and we only have the regular habaneros here. The author, Petra Page-Mann, may have the answer to your question – I suggest reaching out to her at petra@fruitionseeds.com. Just harvest 2 first fruits from the Habanada I started from seed. One is long (like the picture), the other is small and wrinkly like the habanero peppers. The Habanadas are at least 200 feet from the habaneros. Have you seen habanada seed produce small peppers? Congrats on harvesting Habanadas! I would recommended reaching out to the author of this article with your question: petra@fruitionseeds.com. Can I use retained seed from the Habanada pepper for starts or is the seed unviable due to breeding? Hi James, thank you for your comment. I recommend contacting the article author Petra Page-Mann at petra@fruitionseeds.com.